The French engineered Talbot Matra Murena is a classic three-seater sports car which was only manufactured from 1980 until 1983. Among features that the Talbot Matra Murena is known for, its seating arrangement is one of the most unique. You want to know why? This is because the Talbot Matra Murena had only three seats and what is odder is the fact that the three are all in the same row! The middle seat can be folded to form an armrest with the two other seats found on the left and right side of the car. 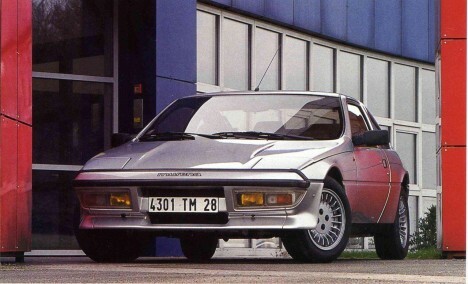 The Talbot Matra Murena also had a different engine selection. Its base version made use of a 1.6L displacement engine. Although the more advanced and enhanced version was given a much more powerful 2.2L engine. The Talbot Matra Murena made use of a mid-engine layout. This is quite rear for sports car since the engine hatch is mounted at the back of the passenger cabin. The Talbot Matra Murena’s exterior design is somewhat awe-inspiring because of its futuristic appeal which is always a hit to the general automotive enthusiasts. The mid-engine layout complements the elegant body shape of the car since it conveniently hides the engine practically inside the passenger compartment. Its body is completely aerodynamic and very stylish indeed considering it was made in the early 80’s. The Talbot Matra Murena is considered to have a relatively perfect balance and a remarkable tire-grip. You will surely get hooked once you ride the French sports car with its effective handling and powerful brake system. To top it off, the Talbot Matra Murena hosted all the luxury expected in an elegant sports car from carpeted floors to the laminated wide windshield with four electric screen washer jets! The Talbot Matra Murena during its development stage, was given the codename a M551. Talbot Matra Murena incorporated similarities from its predecessor, the Matra Bagheera. Its base structure was similar to the Bagheera although substantial engineering facelifts were made to address the older model’s design issues. The main engineering design issue which had to be addressed coming from the previous Matra model lies in the space frame material used. In the older model, rusting was prevalent since the car was basically made of steel frames wrapped by fiberglass and polyester panels. The newer Talbot Matra Murena eliminated this engineering design issue through the use of galvanized steel frames to build a rust free space frame for the vehicle. Only the car’s suspension was the only base chassis part not made of galvanized steel! The Talbot Matra Murena was the first sports car to ever employ this technology, something Matra can be proud of which has been included in the sports car hallmarks. The production of the Talbot Matra Murena ended in 1983, barely four years into production. The classic French three-seater sports car was discontinued when the Matra Automobile Factory underwent management changes in 1983. The former Matra plant was then converted to the Renault Espace minivan production hub. Some would think that this is a sudden and tragic end for the classic Talbot Matra Murena. Tsk, tsk, tsk.